i'm making lots of little things to sell at an xmas boutique next weekend. 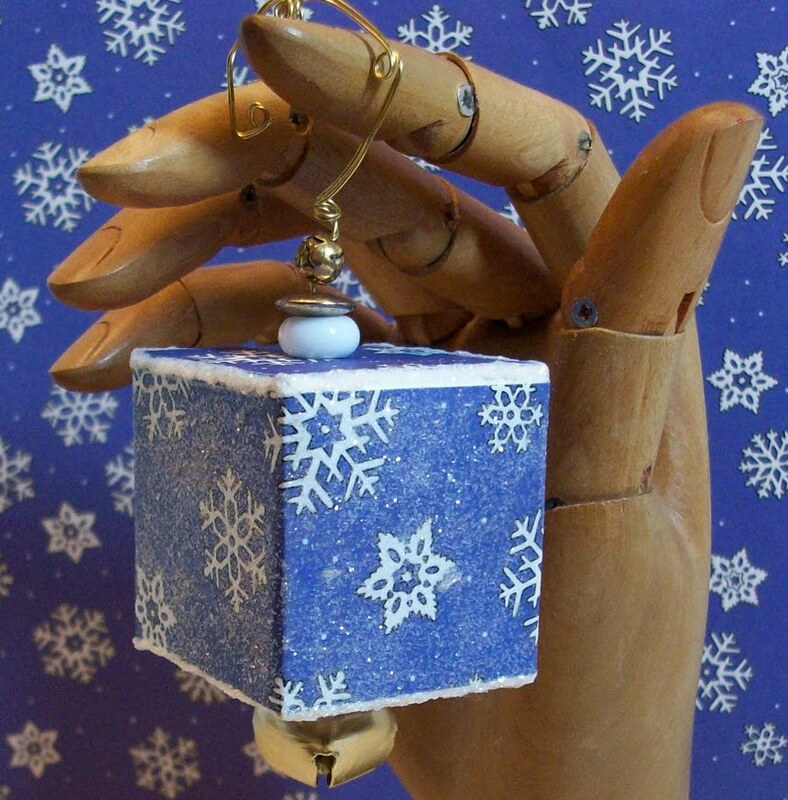 these ornaments are made with blank board blocks that come in three sizes. 1. to decorate a 1-1/2" block - cut a strip of paper to 1-3/8"x 6-1/2". 2. center and wrap the strip around the sides of the block, adhering the paper to each panel by brushing a thin coat of mod podge. 3. use a craft drill or a japanese screw punch to make a small hole in the top and bottom panels (these boxes are smooth illustration board on the outside, with a layer of corrugated underneath for rigidity, and hollow inside). 4. cut two 1-3/8" squares of paper and adhere one to the top, one to the bottom, allow block to dry. 6. brush a thin coat of mod podge on all sides to seal the paper. sprinkle a little white or clear glitter on top while wet, allow to dry. 7. apply a line of distress stickles (i used rock candy) or other clear glitter glue along the top edge, in between the paper seams where there is a little of the white block showing. allow to dry, then turn over and repeat on the bottom edge, allow to dry. 8. cut a piece of beading wire (i used 24 gauge gold) to approximately 15' long. thread a jingle bell to the center and pinch the wire in close to the bell, folding the length of wire in half. 9. poke the double strand of wire into the hole in the bottom of the block and guide it up through the top hole, bringing the bell flush to the block. 10. thread a few beads on to the wire at the top, then use round-nose beading pliers to twist a couple loops in the wire just above the beads to secure. 11. shape the remaining wire at the top into a curve for a hook, adding loops with the pliers to give the hook more stability. these little blocks give you lots of options for showing off pretty holiday papers and embellishments...you can even glue little photos of the kiddies on the sides. this is a 4.5" round, black paper maché box that i coated with iridescent medium, then stamped with black ink. i strung beads on wire and glued the strand with silver ribbon around the base. the knob on the lid is a glass xmas ornament - turned upside down, recessed and glued into a hole in the lid. i'm head over heels for this new book - fanciful felties from mummysam. i want to make all the characters and hang them on a tree for christmas. i adapted the author's instructions a bit, I'm using all felt scraps and i'm stitching on the outside. her hand-drawn patterns are beyond adorable - this is collin and his country cottage. each one took just a few hours to make - some hand-stitching and some machine stitching. last night on cool2craft, i showed my shortcuts for staining and embellishing a cute little wooden box (it was from walnut hollow, but i think it's discontinued). this box comes unstained - i just spritzed it all over with memories mist spray ink (pale ale color) to give it a nice warm caramel color. i made mosaic tiles with cool2cast plaster (so quick and easy!) then dabbed them with a couple colors of adirondack alcohol inks. four tiles fit perfectly inside the recessed lid with just a little hot glue. easy peasy! 1. choose a scenic card - either an indoor or outdoor view (do you want to peek in or peek out?) - trim it down to fit within the front of whatever blank folded foundation card stock you like. 2. use a square punch to diecut a series of squares into a piece of colored cardstock to look like a windowpane - whatever size and configuration of panes best frames your scene - trim your windowpane to just a bit larger than your scenic card. 3. cut small triangles of ultralight lutradur to fit in the corners of a few panes and glue to the back side...snowdrifts! 4. trim out accent images from other cards - use outdoor things like birdhouses and flowers if your window is peeking inside, or use indoor things like a stuffed toy or a gift box if your window is peeking outside. 5. distress your windowpane with rough, random swipes of ink or glitter glue, and/or embellish with metallic dots, if desired. 6. adhere your accent images to the front of your windowpane using dimensional foam tape or glue dots. 7. adhere your windowpane to the scenic card using dimensional foam tape or glue dots. 8. center and adhere your layered windowpane scene to the front of your folded foundation card with your paper adhesive.